To understand how people behave in an uncertain world - and to make viable recommendations about how the law should try to shape that behavior - legal scholars must employ a model or theory of decision making. Only with an understanding of how people are likely to respond to legal rules can legal scholars, judges, legislators, and regulators craft rules that are likely to encourage desirable behavior and discourage undesirable behavior. Rather than rely on rational choice theory, behavioral law and economics scholars (or legal decision theorists) have turned to Daniel Kahneman and Amos Tversky's "prospect theory" to inform their analyses of law and legal behavior. 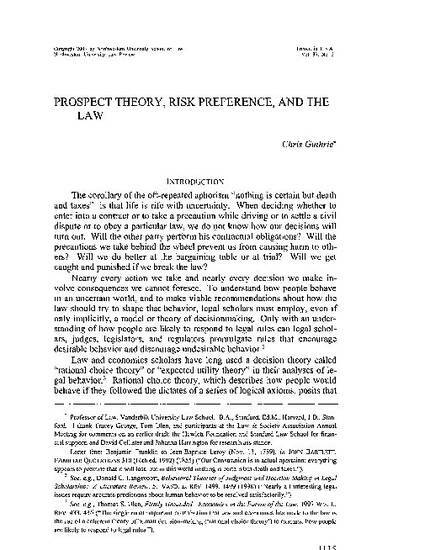 Prospect theory contains several empirical propositions relevant to legal analysis, but this paper focuses primarily on prospect theory's insight that people often make risk-averse choices when selecting between "gains" and risk-seeking choices when selecting between "losses." The paper surveys efforts in the legal literature to use this insight to inform the way legal scholars think about law and behavior in several doctrinal areas. The paper acknowledges some limitations associated with this work (e.g., external validity, differences in individual decision making, differences in group vs. individual decision making), but it concludes that prospect theory is nonetheless a valuable tool for legal scholars and policy makers.